I love it when I hear that brands are made locally. I love it even more when there clothes are beautifully made, using brilliant fabrics and the great colour combinations. Chalk and Cheese is all that and more. Made locally using great fabrics and the most uncommon colour combinations. Their styling is simple and it allows children to be just that, kids! We have received our beautiful order on Friday and the range is now online and instore. 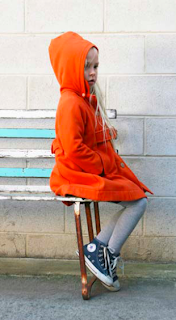 I love the bright and beautiful "keepsake" coat in the brilliant orange, it works so well with the "coco" (my dogs name!) skirt and the japanese wool top.